A new Entrepreneurial Skills Pass (ESP) to prove that a student has strong entrepreneurial skills and business acumen. European youth often lack necessary job skills and entrepreneurial competences, which contributes to consistently high youth unemployment rates. To address this problem, a group of policy and industry stakeholders gathered today to launch the Entrepreneurial Skills Pass (ESP), a European qualification in entrepreneurship for young people, giving potential employers proof that its holder has real entrepreneurship experience and relevant job skills. It is hoped that this pass will help young people increase their chances of finding a job or launching their own business. The initiative was developed by JA-YE Europe, the Austrian Federal Economic Chamber (WKO), CSR Europe and the Danish Foundation For Entrepreneurship-Young Enterprise (FFE-YE) and co-funded by the European Commission with further support from a number of private enterprises. Hosted by MEPs Petra Kammerevert (S&D, Germany) and Jutta Steinruck (S&D, Germany), the round-table discussion stressed the importance of entrepreneurship education and financial literacy programmes in helping increase youth employability. Read the summary of the disucssion HERE. 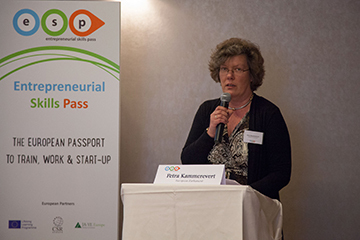 MEP Petra Kammerevert opened the discussion by underlining entrepreneurial education as a much needed long-term investment. “A shrinking and increasingly competitive job market presents a serious challenge for policy-makers. We must ensure that European youth possess all the necessary job skills that are attractive to employers or that they hold basic entrepreneurship skills that can help them become self-employed. After all, having a competent young workforce is crucial to retaining competitiveness of the EU economy as a whole”. The participants also discussed the current lack of basic financial literacy skills among youth as was demonstrated by a recent study Program for International Student Assessment (PISA) conducted by the Organisation for Economic Cooperation and Development (OECD). Adele Atkinson, a policy analyst at the OECD, stressed the importance of integrating financial literacy training into secondary schools’ curricula. This was further supported by Visa Europe, which recently conducted its own research on Europeans’ entrepreneurial aspirations. “More than 50 per cent of young people aged 18-24 said they had a good business idea. However, as many as 20 per cent admitted they feared starting-up in business because they did not understand the financial implications of running a business. Therefore, a good financial education is essential to empower more young Europeans to become successfully self-employed, creating new jobs for their peers in the long-term,” said Nick Jones, Head of Corporate Responsibility & Digital Communications at Visa Europe. The Entrepreneurial Skills Pass (ESP) is a new international qualification that runs in 26 EU countries and certifies students (aged 15-19), who have had a real entrepreneurship experience, hold the necessary knowledge, skills and competences to start a business or be successfully employed. ESP includes a full-year in-school mini-company experience; an examination of business, economic and ﬁnancial knowledge; the possibility to access further opportunities offered by small and large businesses, top higher institutions and international organisations across Europe. JA-YE Europe is Europe’s largest provider of entrepreneurship education programmes. JA-YE brings the public and private sectors together to provide young people in primary and secondary schools and early university with high-quality education programmes to teach them about enterprise, entrepreneurship, business and economics in a practical way.